A suite of electric bicycles are rolling into U.S. markets this year, giving urban commuters a way to avoid gridlock without ever breaking a sweat. E-bikes are already common on the streets of Europe and Asia, where cycling has always been a popular way to get around cities. In the United States, however, motorized bicycles have seen limited adoption beyond the food delivery business and among older cyclists in need of a boost. The new Riide e-bike is marketed as a light and stylish electric bicycle for young urban commuters. Photo courtesy of Riide. Riide, a Washington, D.C.-based startup, is one of several companies looking to change the image of electric bicycles in America. "E-bikes kind of have the stigma that they're not cool, so we wanted to create something that people would be excited to ride," said Jeff Stefanis, the company's co-founder. 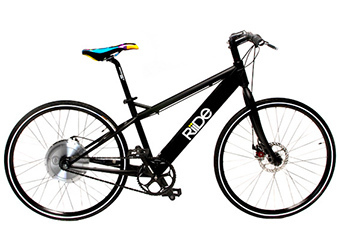 The Riide bike's sleek, sporty design makes it look like the Tesla of electric bicycles. However, the $1,800 price tag -- worth roughly two years of public transit fares -- makes Riide one of the more affordable e-bikes on the market. It's early yet for Riide, but so far the response has been strong. Riide's campaign on Kickstarter, an online crowdfunding tool, came to an end earlier this month having raised more than $115,000 in bike orders and seed money, well beyond the startup's $50,000 fundraising goal. Long term, the company's ambition is to transform urban transportation in the United States, Stefanis said. "The goal isn't just to create a niche product. It's to change the way we move about cities." The growing electric bike segment could, in fact, revolutionize commuting as more people move to cities and look for convenient ways to travel. Most e-bikes have a range of 20 miles or more, which is longer than the majority of urban trips, and can charge using regular wall outlets. E-bikes also come in various styles to suit different needs. Some products, like Riide, act more like scooters by delivering electric power to the wheels at the twist of a throttle, eliminating the need to pedal. Other companies make pedal-assist wheels that can be retrofitted to traditional bikes to give them a little extra oomph. The Massachusetts Institute of Technology, for instance, designed a pedal-assist wheel to showcase the appeal of e-bikes at the 2009 Copenhagen, Denmark, climate negotiations. According to Assaf Biderman, associate director at MIT's SENSEable City Lab, the wheel operates using sensors that instruct the electric motor to respond seamlessly when the rider needs more power. "You ride it just like you ride any other bike, but it feels like the distances have shrunk and hills have disappeared," he said. In 2012, Biderman founded the company Superpedestrian to bring the so-called Copenhagen Wheel to market and is now taking preorders. A number of other e-bike products have launched in the United States in recent months, including the FlyKly pedal-assist electric wheel, Local Motors' Cruiser e-bike and an electric version of the vintage-style gas-powered bike made by Derringer. German automaker Daimler AG is also getting into the game. This year, the manufacturer of Smart Fortwo mini-cars will test sales of the Smart Electric Bike at a handful of dealerships across the United States. The $3,800 bike went on sale in Europe last year. 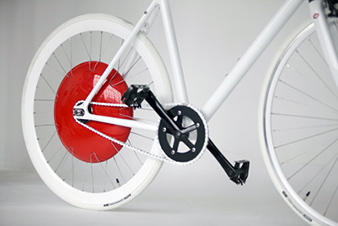 The Copenhagen Wheel transforms ordinary bicycles into hybrid e-bikes that add electric power to your pedaling. Photo courtesy of Max Tomasinelli. According to Navigant Research, e-bike sales in the United States. will top 104,000 units by 2020. Europe's e-bike market is expected to reach 1.9 million units by the same year, while China's could surpass 40 million units. Dave Hurst, research analyst at Navigant, said the U.S. e-bike market faces two main hurdles: infrastructure and public acceptance. Electric bicycle riders have to contend with the same bike lane shortage as traditional cyclists, he said. Also, bicycles in the United States are often treated as toys or sports equipment and less as commuter vehicles, which could make it difficult for e-bikes to take off, Hurst added. Furthermore, while electric transportation carries the reputation of being green, it's unclear how good e-bikes actually are for the environment. If they predominantly replace trips taken by traditional bikes instead of cars, they could have a net negative effect. Will regular bikers like them? "If you're using a bike simply for the greenness of it, then an e-bike is sort of working against that purpose in all aspects," Hurst said. "Not only are you using electricity, which depending on how it's generated can be pretty dirty, but you also have the production side of it where you have to produce batteries and motors that you don't have to produce on a traditional bicycle." But e-bike advocates argue that although they won't fully replace gas-powered vehicles, reducing the number of trips taken by car will have substantial sustainability benefits. According to Biderman, data collected by MIT show that people opt for motorized transport of some kind for trips of 10 miles or more. If e-bikes can replace even some of those trips, it's a good thing for the climate, he said. Even traditional biking advocates are getting on board. Tim Blumenthal, president of People for Bikes, a leading U.S. bicycle advocacy organization, said his group was initially opposed to e-bikes because they were considered too fast for bike lanes and too powerful to produce health and environmental benefits. But test riding some of the newly available e-bikes changed its thinking, Blumenthal said. "We thought about if we had a choice between someone on a bicycle with a little bit of electric pedal-assist or somebody being in a car, we'd pick in a lot of cases the pedal-assist bike because it takes up less space on the road for parking, it's pretty energy efficient and it fits with our basic idea that when people ride bikes, all kinds of great things happen," he said. "It's not just about the person who's riding who's energized and active and happy," Blumenthal added. There's also "air quality improvement, congestion reduction, reduction in road wear and tear -- the list is really, really long."